The IT department were having to manually update email signatures for members of staff, which was a constant struggle due to the frequent use of signatures for marketing activities. Exclaimer Signature Manager Outlook Edition gave the School the ability to maintain every email signature, add content banners quickly and send out signature updates to staff easily. Situated in the district of Pembroke on the island of Malta, the Verdala International School is an independent, coeducational day and boarding school which offers an educational program for students of all nationalities aged from 4-19. Uniquely located in a 125-year old British-built fort overlooking the Mediterranean, the School first opened its doors to students as an oil company school in 1976. It was reconstituted as Verdala International School in the 1980s, incorporating a vision of “developing knowledgeable, inquisitive and ethical contributors to the world”. Creating and maintaining a professional email signature for over 100 Outlook and OWA clients had always been a challenge for the School. Being a major part of the local community and the fact that Malta is a small-sized island, staff would often use their email signatures to promote new activities and fundraising events. This was a sound strategy and the marketing department considered the use of email signatures to be a low-cost, yet high-volume marketing channel. The only problem was that it was a laborious process for the IT department to do this manually. Not only did a signature have to be designed by the marketing team, every employee had to be shown how to add it to their machines with all of their contact details. Inevitably, there would always be IT helpdesk requests about missing logos, web links not functioning correctly and incorrect formatting. Non-technical staff would get progressively more frustrated with the disruption to their busy schedules for something they deemed to be an inconsequential activity, with some employees even resorting to modifying signatures directly rather than getting IT involved. In essence, the whole process was not conducive to a harmonious working environment and, with the high number of events taking place in a school year, too many IT resources were being allocated to something that seemed simple in theory but was definitely not in practise. A reliable solution had to be found and as soon as possible. Before we started using Signature Manager Outlook Edition, I had to manually update every email signature whenever there was an update, which was a constant nightmare. 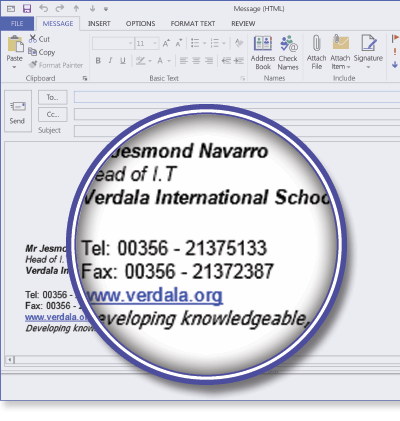 Tasked with finding something that would help to reduce the tiresome nature of this task, Jesmond Nevarro, IT Administrator at Verdala International School, decided to research a number of different email signature solutions. Deciding on Signature Manager Outlook Edition, he undertook a 30-day free trial to test the software’s capabilities and discover if the product would solve the School’s longstanding signature issues. “The software had a simple, yet powerful interface with all the tools I needed to maintain every email signature,” stated Mr Navarro as he began his trial. “I could centrally manage how the signatures were distributed no matter where an employee was – remotely, instantly and centrally.” After only a few tests, it was decided that Signature Manager Outlook Edition was the email signature solution that the School needed. Any signature created by the marketing team could be easily distributed to all employees with no issues. “I could now maintain signatures by organizational unit or domain user, create exceptions and incorporate fields from my Active Directory. One click from my PC and every staff member would receive the correct email signature with all of their details autocompleted via the AD,” said Mr Navarro as he highlighted the software’s ease of deployment. It was fair to say that his team had also been unhappy with the way the School had updated signatures in the past, so it was a relief for him to be able to use dedicated software for complete control. By introducing dedicated email signature software, the Verdala International School succeeded in significantly improving IT efficiency and expanding the impact of its marketing campaign banners. With extra time freed up by having signatures controlled through the Active Directory, the IT department could allocate time for other matters which had been neglected such as improving the functionality of the School’s IT infrastructure. At the same time, the marketing team could now capture important data from each signature banner more easily and improve the content where appropriate, which was not something that had not been possible before due to the manual effort involved in getting new signatures added to employee emails.